The first step of any level is to work out what goal it needs to accomplish. Some levels need to teach the player how particular puzzle elements or mechanics work, some need to remind them of older mechanics. Others don’t have any restrictions, but they do have to be fun puzzles. 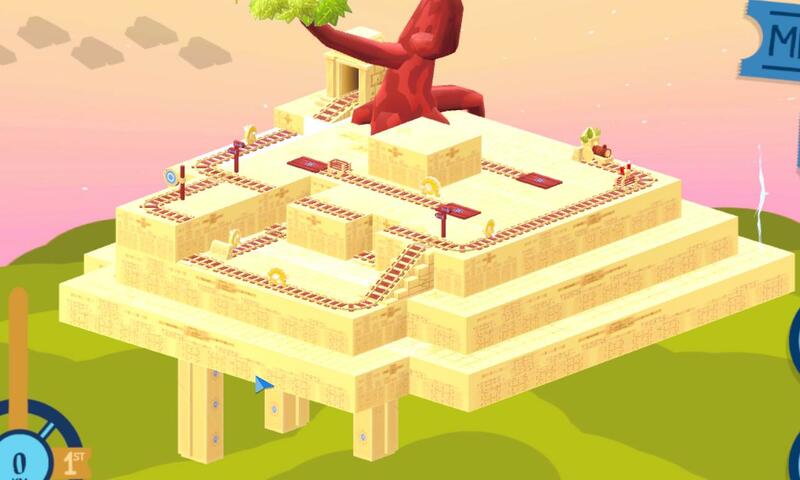 I also need to get an idea of how difficult the level is to play – with a “pure puzzle” level it can go anywhere after all it’s mechanics are introduced, but with a “teaching” level it’ll have a specific place in the game it needs to go – and can’t be more complex than the next level, or the difficulty curve is off. 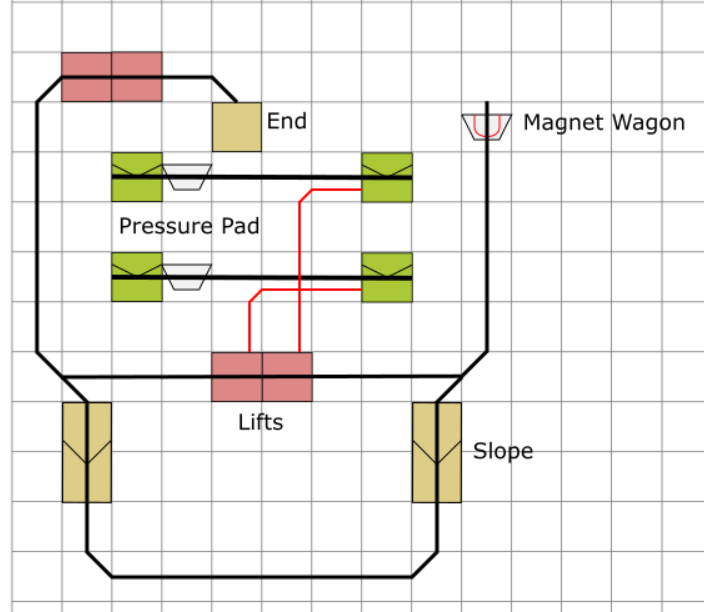 For the level i’m working on today, we identified that players had difficulty with using Magnet wagons – specifically that the first Magnet level had them pull wagons parallel to the train, and they didn’t realise they could also be used perpendicularly. I tweaked this level to include a small perpendicular pull, but it’s not very obvious, and I wanted to drill it into players heads. The solution: dedicate a whole level to that one use. This also meant it had a specific place in the game – between J2 and J3 – and so had to fit neatly onto a difficulty curve between those two. This is a fairly vague stage, yes, but there’s no fixed way of doing this. I’ll run through my thought process. First thing we need is a magnet being pulled sideways. All these sketches are done in Inkscape – often I do them on paper instead, but they’re rarely presentable enough to use then, particularly after being scanned/photographed. Magnet pulls the other wagon sideways. 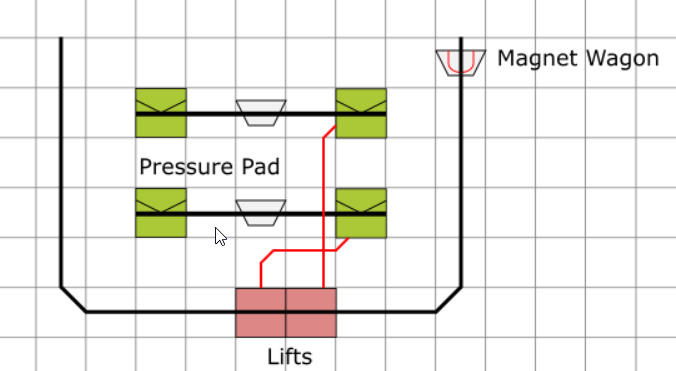 Pressure pad opens route to end of level. Job done. Ship it! Players have now seen that magnets can do this without really thinking about it. What I want to do now is to force them to actively think about doing it. To do that, lets curve the level around and make them do it all over again. 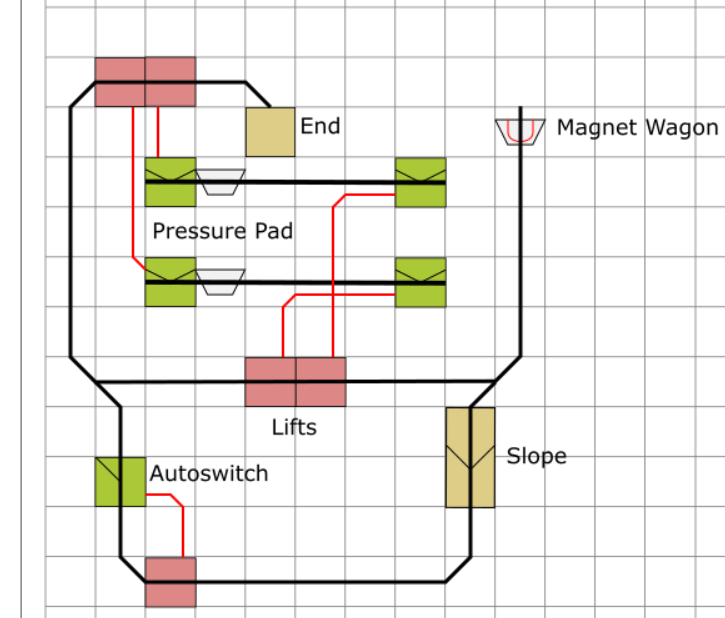 The red lines indicate where two things are connected – so those two pressure plates control the two lifts: the lifts rise up from below and allow access to the rest of the level. Except! If you turn the corner while still pulling the magnet, it pulls the nearer wagon perpendicularly off the button and lowers the lifts, thus trapping you and making the level unwinnable. Not what we want to achieve… but a pretty neat puzzle, maybe? Okay, lets tweak the scaling (so it’s harder to get stuck) and put out an alternate route. That’s stupid easy – you never need to go over the lifts at all. Lets change that up. 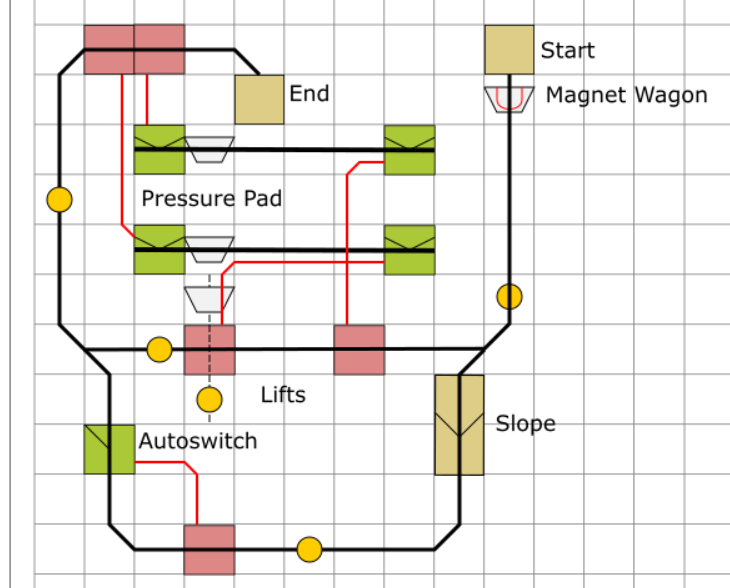 Thats more like it – now you have to move the wagons across to move the lift up, then put the magnet on the lift at the bottom, then go round and use the autoswitch to move that up, and then you can use the magnet to set up the second set of lifts and head for the exit. Does it teach players the magnet mechanic? Yes – first they see it happening, then they need to make the decision to repeat it. Just pushing the “forwards” button doesn’t help: they need to realise that the magnet will break the connection, and then figure out how to move it to the other side of the lifts anyway. The last thing to do is put the collectibles in. Most are easy to get, but I want one alternate harder one. These add extra challenge for players who want something more difficult, but need to not complicate the basic level for other players. In this case, one of the lifts is a cross-piece. When it’s lowered, a wagon can be pulled across it and onto the final collectible. This requires the lift to be lowered and the magnet to be on the lower level next to it all at once – which means a little bit of jiggering of the lift positions, but that’s okay. Better than okay – it allows me to make it harder to trap yourself without making the lifts weirdly off-centre. There’s another thing I’ve been keeping track of, and that’s the final level’s artistic design. I’ve been given certain instructions by the artistic team that I intend to keep to – these levels are set in a “mayan temple” style area, so need to have a stepped, ziggurat feel to them. That means mostly that the levels need to be high in the middle and slope outwards: that’s tricky since magnets and fans only work on the same level, but I think I’ve given myself enough space for it. I can always be flexible when building the level, and can give instructions to the artists as to what else they can be flexible with. I can’t identify any major problems with it, and it’s just a touch more difficult than the previous, and a bit less difficult than the next (so maybe more levels could fill that gap and smooth out the curve?) Next up, making it. Locomotion is built in Unity, and prefabs have been set up for all the track configurations, so it’s easy to build, mostly click and drag. The built version looks like this, with nothing but the basic mechanical functions in place. You’ll notice some small changes, most notable the exit, which I moved because it was strange and off-centre at its original position. This stage of development is when I make any changes such as this that are needed from an aesthetic standpoint, and have at least some idea of how I want the final “shape” of the level to be. I also adjust the camera and add the automatic camera changes – about the only thing that I’m not setting up now is the conductor lines – while we can sometimes guess where they’ll be needed, I much prefer to get levels tested without the tutorials and know for sure where players can work out what to do. The next stage of design is building the rough greybox art mock-up for the level. 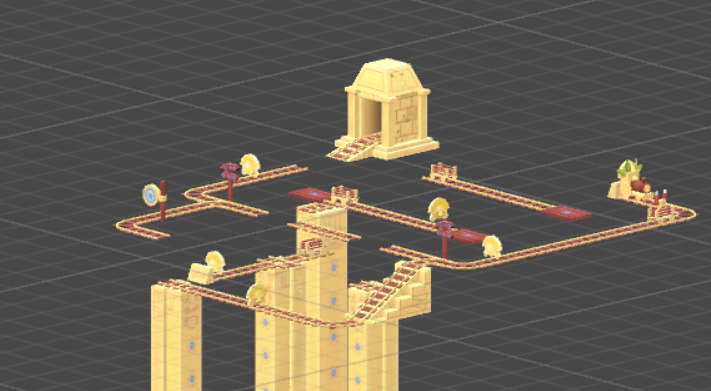 I’ve worked as an environment artist a little myself, but other people are doing that for Locomotion, so all I do is give a vague idea of what’s needed for the level, so the track layout and art design compliment each other at least a little. I’ve slapped a temporary texture on it and run it in game for readability, but basically that’s it! I hand it over to the art team (occasionally with some notes about what can change and what mustn’t) and move on to the next one. The art team is working on the level now. Somebody remind me to edit in a picture of the finished level when it’s done, kthx. The last thing to do is to write the level up for our testing team, so they know what each element of the level to do and what the correct solution is. This is useful and all but not terribly interesting. Unless you can do it as a blog post, then it’s tons of fun. You get to be much less formal and professional.